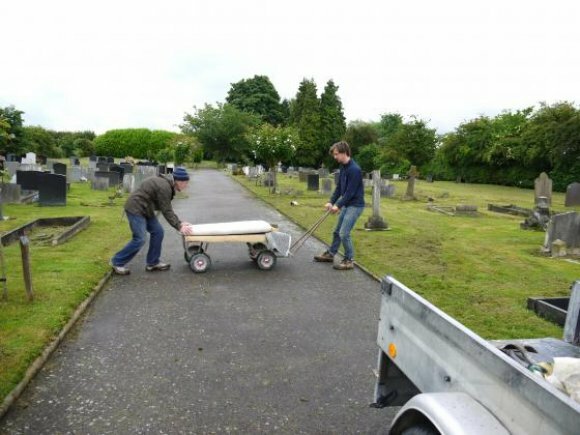 Rothley Cemetery was opened for burials on the 2nd September 1904 when Rothley Parish Church Burial Ground was closed. 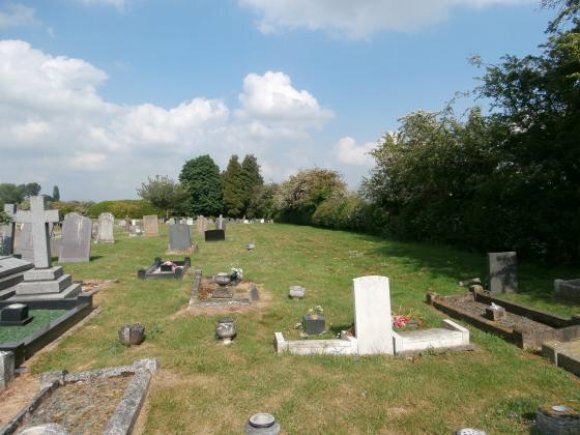 In 2003 I started to record the history of burials in the new cemetery and I was made very aware of how many paupers from the nearby Union Workhouse were buried without any memorial stone to record their deaths. 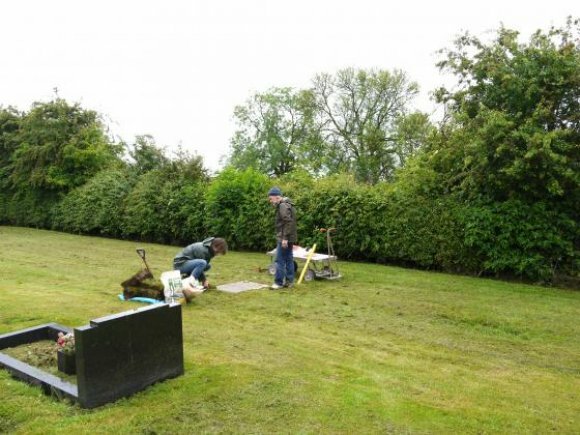 We do know where their graves are, including those of the children who died at birth, but just see a large piece of grass as the only indication of the presence of burials. 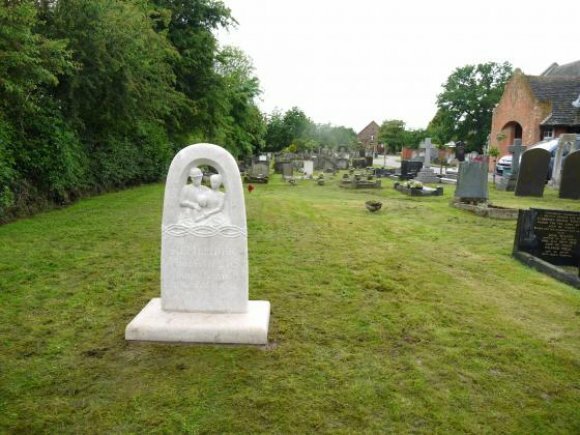 I wanted to provide a memorial to those men, women and children who died in the Barrow-upon-Soar Union Workhouse in the Parish of Rothley so that their graves will be remembered into the future. 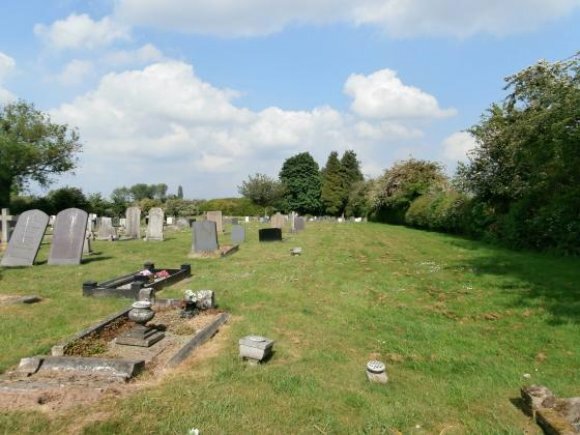 It is proposed to have the cemetery chapel dedicated to the lives of all those who lived, worked and died in this feared institution-the Workhouse. Research is currently underway in 2014 to achieve this. 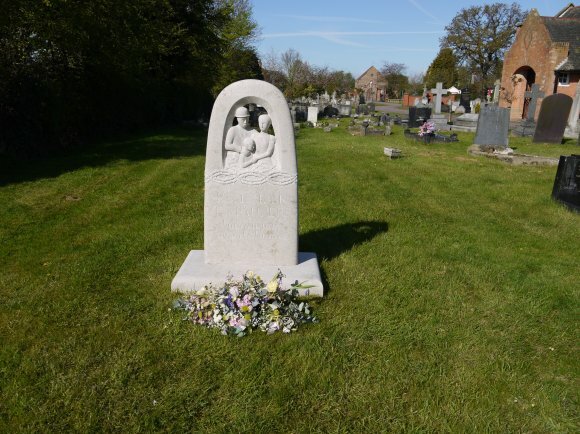 Memorials by Artists was founded in 1988 to help with the commissioning of beautifully lettered memorials for churchyard, cemetery, garden or public place. 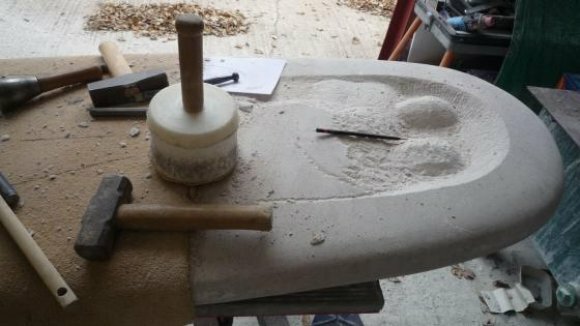 It has been created from a network of many of the finest independent designer/lettercarvers working in the UK and helped with the commissioning of thousands of individual and expressive memorials. 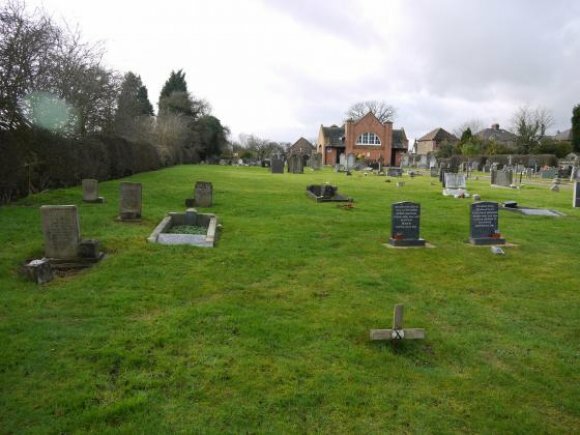 There are publications available to help with ideas, graveyard and cemetery rules and regulations, how to commission and help with recommendations based on ideas and requirements. 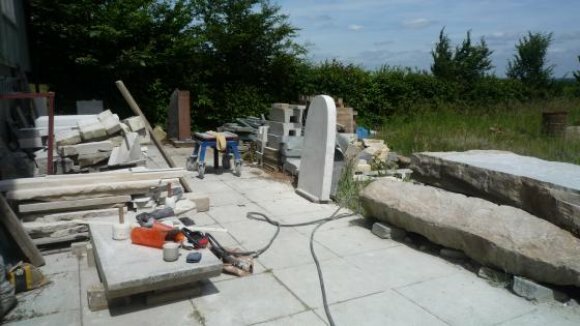 On the 21st March 2012 I contacted Hilary Meynell of the Memorial Arts Charity, Snape Priory, Saxmundham, Suffolk to find out how to proceed with my idea for a memorial to the paupers. I completed a form about the kind of memorial, where it was situated and other ideas. 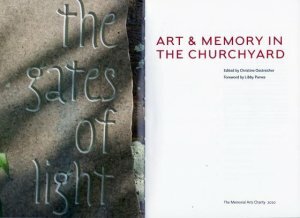 I then sent for the book Art and Memory in the Churchyard with details of artists and examples of their work. This was a very good publication and I was immediately drawn to a piece of work by Geoffrey Aldred 'Stone to the Homeless' inspired by Yorkie Greaves, a 74 year old homeless man who died in Kentish Town, London, in 1996 after living on a park bench for fifteen years. 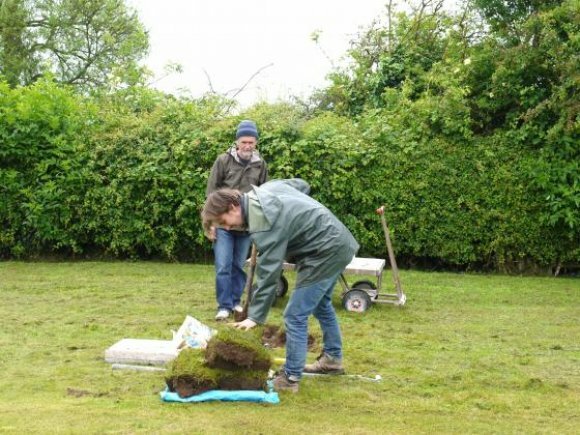 This was my inspiration for the 'Stone to the Paupers' for Rothley. 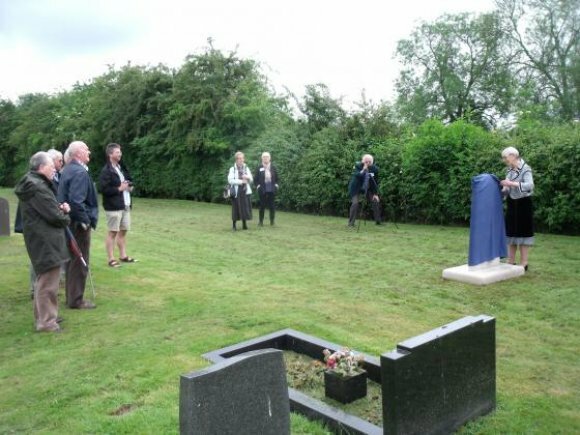 With the help of Hilary Meynell it was confirmed by Geoffrey Aldred on the 24th June 2012 that he would take on the commission of carving our memorial to the paupers, subject to an agreed design. 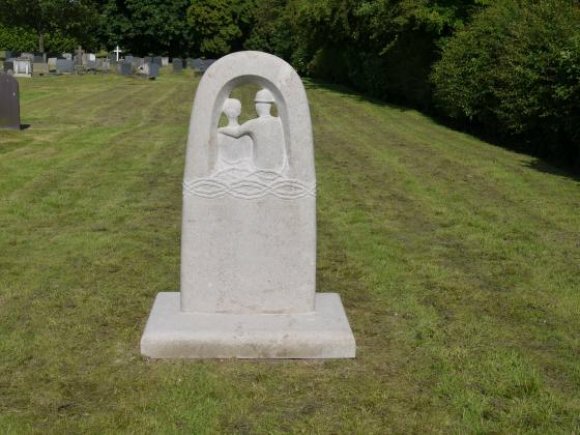 Permissions had to be sought from Rothley Parish Council to erect the memorial and agreement in principle was given but subject to approval of the design. 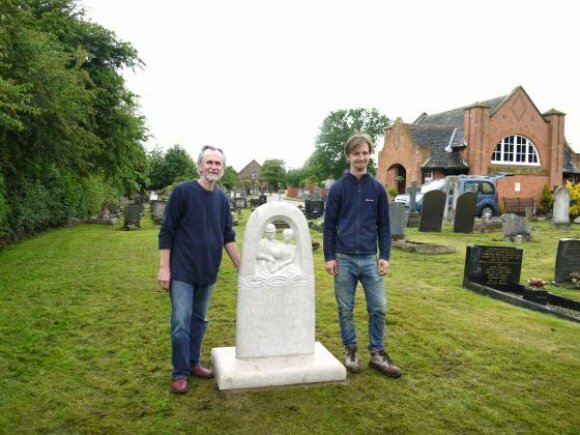 Ideas for the design went ahead and the final design was approved by Rothley Parish Council and the commission placed with Sculptor Geoffrey Aldred, The Stone Carving and Lettering Studio, 9-10 Park Farm, Hundred Acre Lane, Wivelsfield Green, East Sussex, in March 2013 at an estimated cost of £4,000. 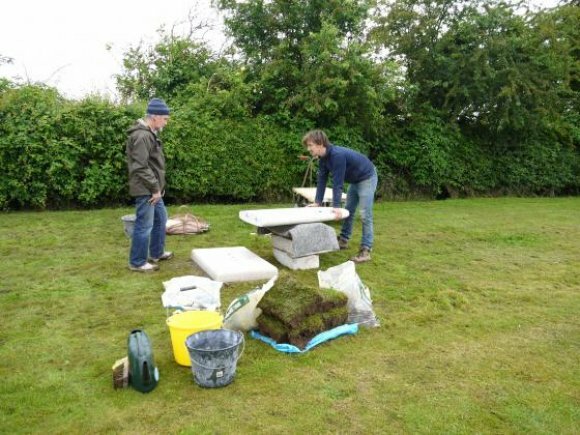 On the 23rd October 2012 I approached the Harry Hames Cottage Charity, which is a Rothley based charity, with the estimate and designs and a request for financial assistance. The excellent news on the 6th November was that the Trustees of the Hames Cottage Charity would provide the full amount of £4,000 for the project to go ahead. 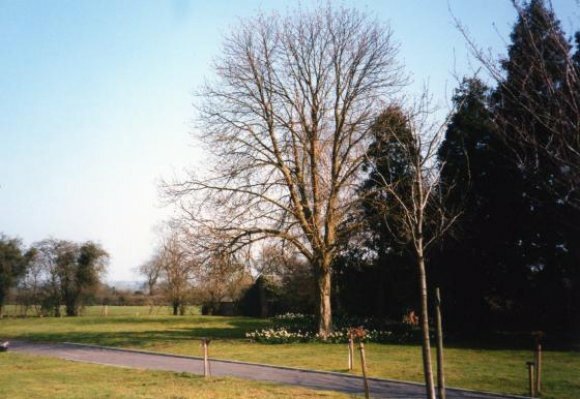 Geoffrey Aldred agreed to start on the designs for our approval and the final designs were agreed by Rothley Parish Council, the Harry Hames Cottage Charity Trustees and the Rothley Heritage Trust and the commission placed on the 9th March 2013. The design shows a family workhouse situation where the males are separated from the females and their children, so the couple are separated, not shown together as man and wife side by side. The child is in the centre but they are linked by their arms reaching out to touch and hold the family together. They wear workhouse clothing so that everyone is anonymous and regimented. The wreath of thorns symbolises the way that the family is bound and entrapped by the workhouse situation. There is also the biblical resonance of the 'Crown of Thorns'. 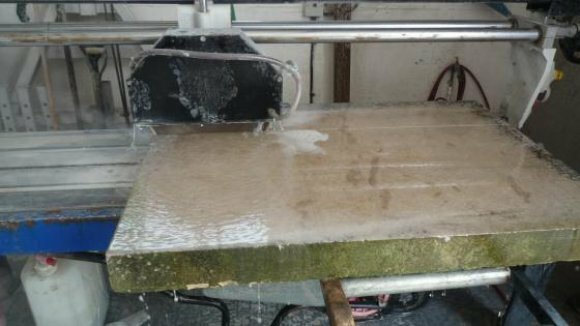 The sculptor, Geoffrey Aldred, says that there were echoes in his mind of Blake's last line from 'The Garden of Love'...'binding with briars my joys and desires'. 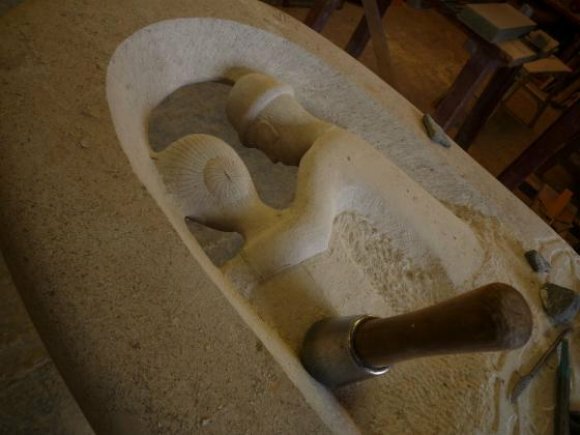 The sculptor has to be given the last word in any carving as intricate work is involved so the final result may vary slightly from the above. The wording is simple and to the point. The design of the lettering is based on a form influenced by 18th century Leicestershire examples, the so-called 'English Letter'. 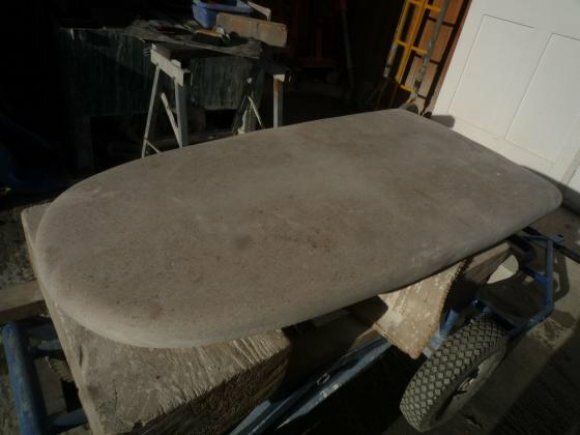 The stone used is Hopton Wood and is quarried in Wirksworth, Debyshire. This is considered to be a better stone than Portland and not so pale and was used by Geoffrey Aldred for his 'Stone to the Homeless'. The date of installation was Wednesday 4th June 2014. 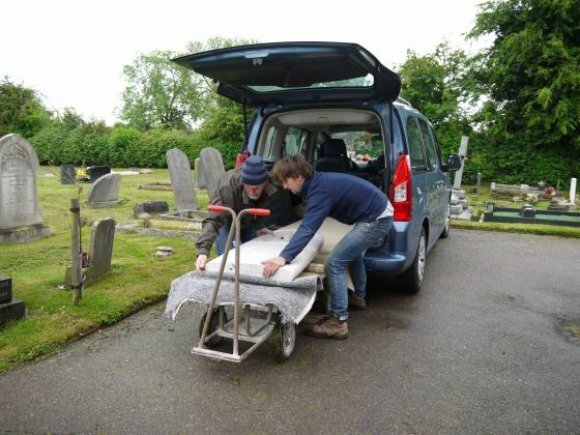 Geoffrey Aldred was coming from Sussex with his apprentice, Tom Sargeant, and arrived at the cemetery at 10.30am. It was a dull, rainy day but all the installation was completed by 2.30pm ready for a quiet, dignified unveiling at 4.00pm. Careful consideration was given to the site of the memorial and this was worked out from the burial plan which shows all the pauper graves in the cemetery. 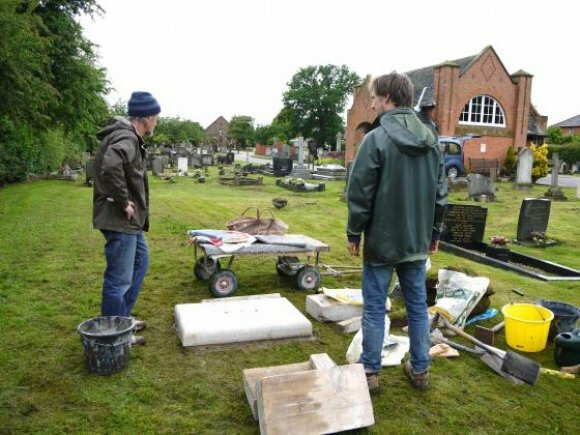 It was decided not to see whose grave it actually stood on as it was for every pauper buried there and also to remember the 274 pauper burials in Rothley Parish Churchyard. 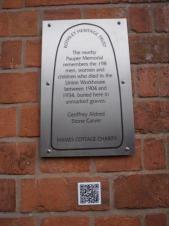 Present at the unveiling were the four Trustees of the Harry Hames Cottage Charity who were thanked for funding this memorial. 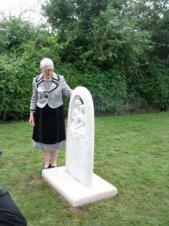 The unveiling was performed by Marion Vincent MBE on Wednesday 4th June 2014. 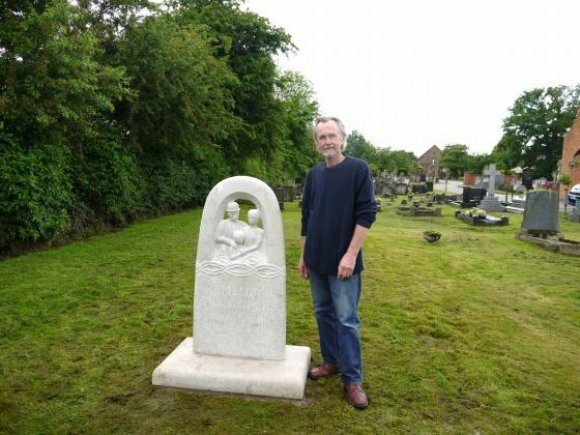 With thanks to Geoffrey Aldred, Stone Carver, for his dedicated craftsmanship that has created this tribute to all the paupers who died in the Union Workhouse in the Parish of Rothley.